The wide variety of useful, free software programs that are now available is made possible by the contributions of thousands of volunteers from around the world. 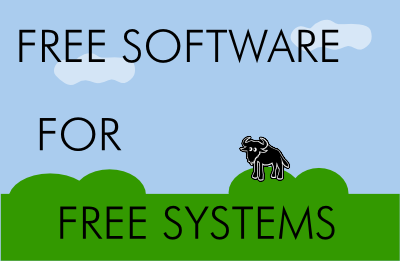 While many of these free programs are created to replace proprietary programs or to solve a developer's particular needs, each and every free program can be part of a greater goal -- the creation of a fully free software environment. This idea began in 1984 with the GNU Project, an effort to create a free implementation of Unix. Today, GNU programs are most commonly used with the Linux kernel to create the GNU/Linux operating system. The GNU Project is just one example of how people work together for free software. Popular free software applications such as Mozilla Firefox and OpenOffice.org exemplify the value of community and collaboration in the development of free software. We now have the tools necessary to build completely free systems. Today, developers are packaging these tools together to create free GNU/Linux distributions, such as gNewSense and Trisquel. You can also install free software for Windows and Mac OS X, helping to ease the transition from a proprietary system to a free system.